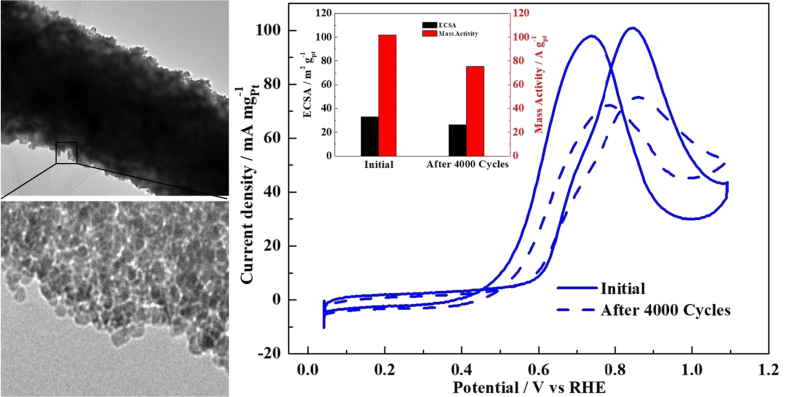 One-dimensional (1-D) antimony-doped tin oxide nanofibers (ATO NF) were synthesized with the electrospinning method and were employed as Pt catalyst support materials for the methanol oxidation reaction (MOR). Scanning and transmission electron microscopy (SEM/TEM) indicate that the ATO NF exhibits a porous nanofiber structure and the diameters are in the range of 100 to 150 nm consisting of the stacked small ATO nanoparticles. Uniformly dispersed Pt nanoparticles were then deposited onto the ATO NF and the synthesized ATO nanoparticles (ATO NP) with a Pt loading of 20 wt%. 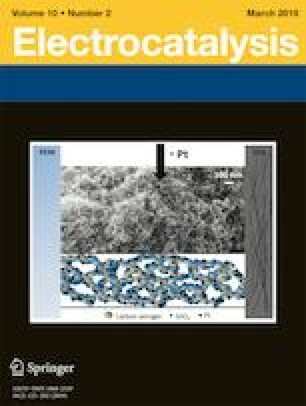 Compared with the commercial Pt/C catalysts, both the ATO NF– and ATO NP–supported catalysts showed slightly lower electrochemical surface areas (ECSA) and catalytic activity towards the MOR. However, ATO NF, when used as Pt support, showed enhanced MOR stability. This enhancement is mainly attributed to the greater corrosion resistance and porous nanofiber nature of the ATO NF, which tend to inhibit the aggregation of anchored Pt nanoparticles and reduce the loss of ECSA during the accelerated life test. XPS results also indicate strong interactions between platinum and ATO particles, which in turn significantly enhance stability towards MOR. Porous ATO nanofibers are synthesized as a support for Pt by the electrospinning method. Such prepared catalyst exhibits enhanced catalytic stability for MOR compared with ATO NP and Pt/C. The authors from UBC gratefully acknowledge support from the Natural Sciences and Engineering Research Council of Canada (NSERC). Financial support for this work is acknowledged from the National Natural Science Foundation of China (Grant No. 51704017) and the International Postdoctoral Exchange Fellowship Program (Grant No. 20160057).